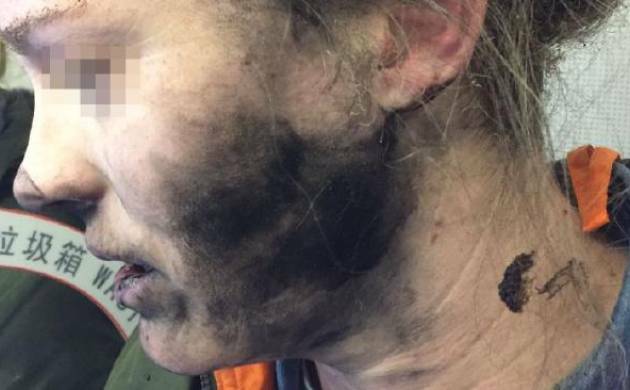 A woman suffered face and burn as her headphones caught fire during a flight to Australia, officials told on Wednesday as they warned about the dangers of battery-operated devices on planes. The passenger was listening to music on her own battery-operated headphones as she dozed on the flight from Beijing to Melbourne on February 19 when there was a loud explosion. “As I went to turn around I felt burning on my face,” she told the Australian Transport Safety Bureau (ATSB) which investigated the incident. “I just grabbed my face which caused the headphones to go around my neck. I continued to feel burning so I grabbed them off and threw them on the floor. Flight attendants rushed to help and poured a bucket of water on the headphones, but the battery and its cover were both melted and stuck to the floor. Pictures show the woman, who was not named, with a blackened face and neck and blisters on her hands, with passengers having to endure the smell of melted plastic, burnt electronics and burnt hair for the remainder of the flight. “People were coughing and choking the entire way home,” the woman added. The transport safety bureau, which did not identify which airline was involved, assessed that the lithium-ion batteries in the device likely caught fire. “As the range of products using batteries grows, the potential for in-flight issues increases,” it said, reminding travellers using battery-powered devices they must be kept in an approved stowage unless in use. Spare batteries should be kept in carry-on luggage, it added. Many airlines in 2016 barred all Samsung Galaxy Note 7 smartphones over fire risk concerns, following reports of exploding batteries. The South Korean electronics giant recalled all its Note 7s, costing it billions of dollars. There have been several incidents involving lithium batteries in recent years with a flight due to leave Sydney in 2016 disembarked when smoke was seen coming from a passenger’s hand luggage. It was later found that lithium batteries had ignited. Also last year, a personal electronic device began belching smoke then caught on fire on a Qantas flight from Los Angeles to New York, the ATSB reported.